What services does the Auburn Board of Public Works (BPW) provide? What communities are served by the BPW? Auburn, Johnson, Brownville and Nemaha Nebraska. Click here to view Service Area Map. Business hours are 7:30 am till 5:00 pm Monday through Friday, however we are staffed 24 hours a day to provide emergency dispatch of personnel if needed by our customers. Please call (402) 274-4981 day or night to reach BPW personnel. All residents are required to fill out an application for service and make a security deposit. Stop by our office at 1600 O Street in Auburn Nebraska to complete our service application. Also, a copy of the resident’s driver license is required. You can find all New Customer forms on our website at www.auburnbpw.com. Call us at 402-274-4981 or email customer_service@auburnbpw.com with your questions. Click here to go to our Application for Utility Service. How soon can I get service connected in my name? Usually BPW can get service connected within two business days of your request. If we are contacted in the morning we can usually accommodate your request. If possible, please contact us well in advance of when you need service. This will help us schedule our work more efficiently and helps us to accommodate all our customers’ needs. How much will it cost to have service put in my name? 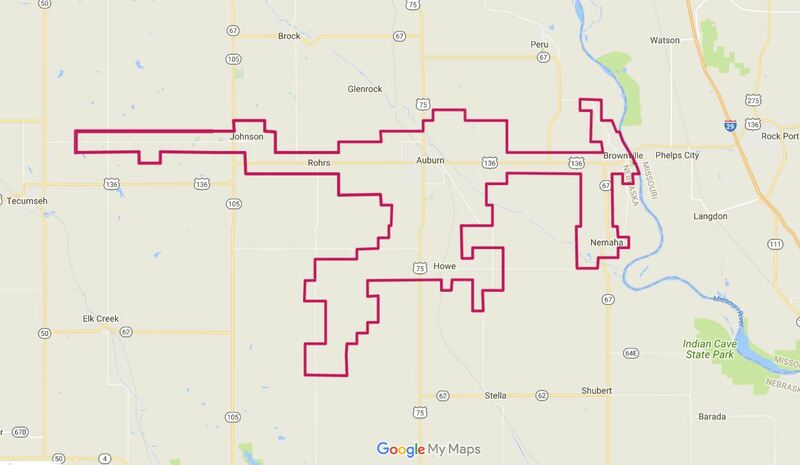 The cost to connect service is $20.00 for service in Auburn, Johnson, Nemaha and Brownville. There is no cost to disconnect service when you request service to end. A $300.00 deposit is required for all new accounts. The security deposit can be waived if your credit score meets our minimum score requirement. This is done by running a credit score check where a minimal fee is accessed to your first bill. After 2 years of good payment history, your deposit will be refunded to your utility account. When is my bill sent out and due? Utility bills are mailed at the end of each month. Bills are considered delinquent if not paid by 5:00 PM on the 15th of each month. Should the 15th fall on a weekend, payments are due by 7:00AM on the next business day. A 6% penalty will be added to all delinquent accounts on the 16th of each month. BPW provides different ways for residents to pay their bills. In Person: Bring your bill and payment to the office located at 1600 O Street in Auburn, Nebraska during regular business hours of 7:30 am to 5 pm, Monday through Friday. After hours, at our drop box located on the North side of our building. Mail: All payments made via the mail must be received by the 15th of every month to avoid a late penalty. ACH Method: Automatic monthly payments from your bank account. Complete an agreement form and return to the BPW with a voided check. Your bill will automatically be paid through your bank account on the 15th of every month. Online Method: Pay your bill from the convenience of your home. Visit XpressBillPay at www.xpressbillpay.com to complete the Xpress Bill Pay registration process. Within the XpressBillPay system, you will have the ability to have your utility bill paid automatically every month with a designated credit or debit card you save on file. There will be a service charge of $30.00 on all returned checks and insufficient ACH Auto Payments. Does the BPW offer a Budget Payment Plan? Yes – the BPW offers an Equal Pay Plan. Residential customers can sign up after living in their home for a minimum of one year. This plan averages your last 12 consecutive utility bills and rates are adjusted in January and July each year. Your bill must be paid by the 15th of each month to remain an Equal Pay customer. What if I can’t pay my utility bill by the delinquent date? When bills are designated as delinquent, a ‘Delinquent Notice’ is mailed to the customer’s address. To prevent an interruption of your utility services, please call a customer service specialist at 402-274-4981 immediately to make payment arrangements. If you make a promise to pay your utility bill and do not pay by the agreed upon date, this will be considered a broken promise. If there are multiple broken promises for the same account, promises to pay will no longer prevent interruption of your utility services. We also can refer you to a number of local and State social service agencies who may be able to provide emergency financial assistance. Who reads my meter(s) and how will I know your meter reader? BPW personnel read all meters monthly using radio read technology. There may be an occasion where our meter readers need to enter your home or business in order to perform equipment maintenance and in the event we need to do a manual reading. If we are unable to read a meter(s), an estimate of the usage could be used for the next billing. BPW meter readers wear uniforms and carry identification at all times. If you have any concerns, please call our office for verification. Where are my meters located? Electric meters are usually on the side or back of your house. We ask that you keep these free from plants and surrounding debris, as we need them to be accessible in order to give you an accurate reading for your utility bill. Most water meters are inside the house; others are in pits, usually in front of the house. Water meters inside the house are equipped with radio read technology. Am I required to have trash collection services? In accordance with Auburn City Ordinances, all residents are required to have trash collection services as long as they inhabit a house within the BPW service area. Our low monthly rates are very competitive and the charge for these services will be included with your monthly utility bill. Senior Citizens over the age of 65 will receive a discounted rate on trash collection after providing proof of age to the BPW. Trash collection services can be suspended for residents who are leaving for an extended period of time, as well as for unoccupied rental properties after the proper forms are submitted to the BPW. Landlords must notify us when the house becomes inhabited again in order to reinstate trash collection. Click here to view our Trash Pickup Route Schedule. Are there recycling services available? Recycling services are provided for all in-town residential customers. Recyclables are picked up on the morning of your weekly trash collection day. You must provide your own receptacle for your recyclables. Does BPW perform service work on furnaces or air conditioners? No, not at this time. Work on equipment in your home would need to be done by a private service provider of the customer’s choice. Why do I get billed a basic charge on services if I am gone and there is no usage? There is a minimum basic service charge for electric, water and sewer. The minimum is determined by the type of services (residential, commercial, etc.). Residential sewer charges shall be based on the water consumed during the months of January, February and March. The average usage of those months will be the basic charge beginning with the April billing each year. Commercial sewer charges shall be based on the water consumed during the previous billing month. What is Radon and should I be worried about it? Does BPW supply Radon Kits? What rebates do you offer? We currently have rebates for: Water Heaters, Air Conditioners, Heat Pumps, Cooling System Tune-Ups, Attic Insulation, Commercial HVAC and Commercial/Industrial Lighting. Check out all our Rebate Program Information under the Current Customer tab on our website, www.auburnbpw.com. What if a customer needs natural gas service? Customers needing gas service should call Black Hills Energy at (888) 890-5554 or sign up online at www.blackhillsenergy.com. What do the colored flags mean in my yard? From time to time you have probably noticed small flags of various colors placed in the grass around town, in your yard or in your neighborhood? Sometimes the grass or ground is also marked with paint. So, what does this mean? It means someone is planning to do some digging in the area and they have called 811 to check the area for underground utilities such as water, sewer, gas, phone, electricity, etc.… Then the area is marked with a flag or paint to indicate what utility is underground. If someone digs up a line, it could be detrimental, therefore it is required you call 811 before you dig. The American Public Works Association (APWA) has color-coded all utilities so it’s easy for those in the industry to immediately identify what utility is running where. If flags are in your yard, please do not remove them, they may have a logo and/or the name of the utility that has placed it there. 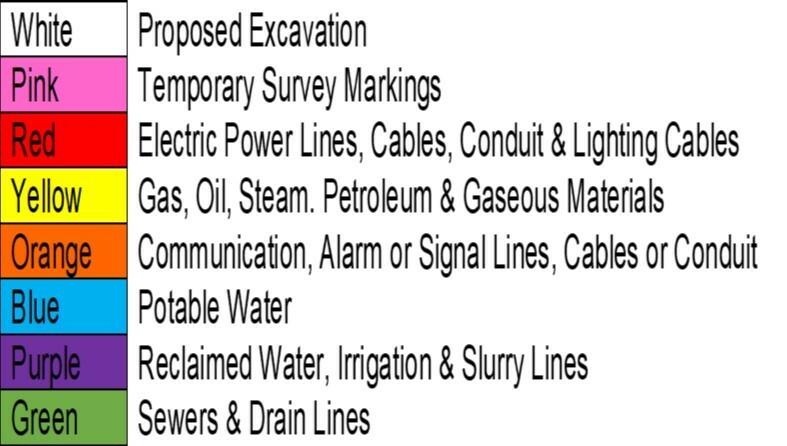 If you question why an area has been marked you can call them to inquire about their placement. Please remember they have been placed there for safety purposes, please leave flags in place for a minimum of 10 days.